The MAX has a new fly-by-wire spoiler system. This is officially to improve production flow, reduce weight and improve stopping distances.The spoiler mixer unit has been replaced by a Spoiler Control Electronics (SCE) unit and the ground spoiler control valve is replaced by a Ground Spoiler Control Module (GSCM). Here are some of the new features that system brings. 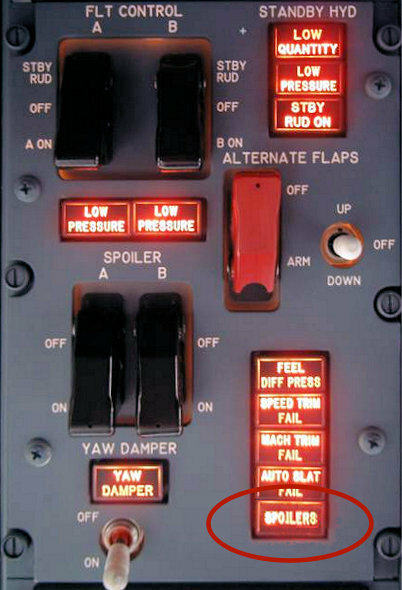 This new amber caution light is located on the bottom right of the Flight Control Panel. It indicates a spoiler fault as sensed by the SCE unit, which means that one or more spoiler pairs are inoperative. 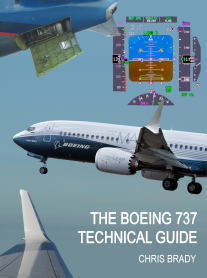 This will give limited changes to the vertical flight path from the spoilers to assist the approach and landing if the normal elevator system jams. The control panel is located on the Aft Overhead Panel, even if it is switched on it will only be active when the flaps are 1 or greater. When in use, the spoilers rise to a preset position; they then extend or retract as the elevator column is pushed or pulled to increase or decrease the rate of descent. NB the MAINT light replaces the PSEU light from the NG series. See Warning systems for details. At flap 15-30 if the thrust is near idle it will slightly raise the flight spoilers to increase drag to increase thrust above idle. 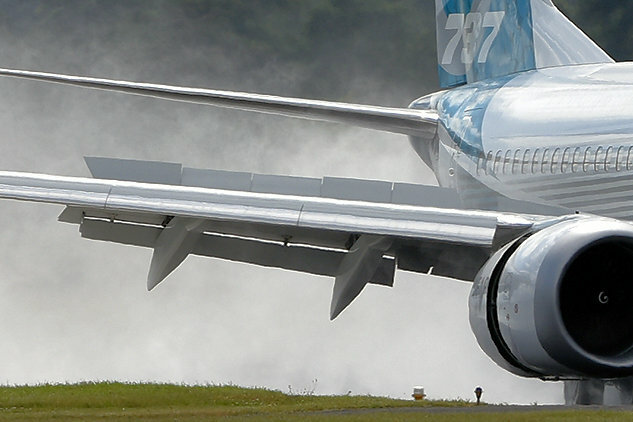 At flap 30 or 40, the flight spoilers will raise slightly to reduce lift necessitating a higher AoA and hence nose attitude to give an "acceptable nose gear contact margin"
EDS gives an increased flight spoiler deflection when the speedbrakes are used above FL300 and the Cabin Altitude Warning is active.